Twelve PRS members enjoyed riding six diesel/two steam trains and one dinner tram in Australia on Mountain Outin’s (led by Rolland Graham) August/September trip to the land where the moon looks upside down. This article relates my experiences on the two most unique railways which were the new line from Darwin to Alice Springs, the GHAN, and the SAVANNAHLANDER from Mt. Surprise to Cairns as well as the best dinner train Julie & I have had the pleasure of riding – COLONIAL TRAMCAR RESTAURANT in Melbourne. The nearest port in Australia to the Far East, Darwin, will decrease containerized freight cost with approximately six mixed freight trains a day to Southern Australia instead of using road trains (a truck pulling three trailers)-justification for extending the line. 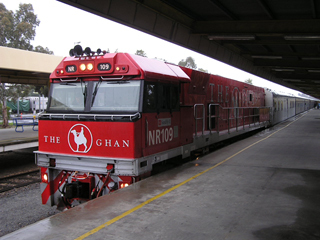 Passenger service on the GHAN, as in “Afghan”, (the emblem is an Afghan on a camel in recognition of their efforts in opening up the inhospitable interior.) is one day a week (400 customers) and has been sold out since the new service began in the middle of February, 2004. We left 100,000 people in Darwin at 10 AM. The Darwin Station is considerably out of town and yet there were many people taking pictures and seeing us off. The initial scenery was palm trees, ten foot high grass eating termite mounds, then continuous “gum” (Eucalyptus) trees and flat terrain with small hills. In the Gold Kangaroo section the trip starts off with a welcome aboard champagne reception along with some history. We arrived at 1:40 PM in Katherine where the train stops for four hours to tour the town, helicopter ride, canoe or take a three hour river cruise through the beautiful Katherine Gorge. No fresh water (“freshies”) crocodiles were spotted. Gold Kangaroo First Class Service provided gourmet cuisine in the dining car. All prepared fresh under the catering of Quantas. Traveling overnight with a two hour stop at Tennant Creek to insure our arrival after breakfast in Alice Springs, we arrived at 9:20 AM in a town of 20,000 out in the bush. The four and a half hour layover allowed you to tour the city or most went to The Desert Wildlife Park to learn about the desert ecosystem and life in the “Bush, Outback”. There were over 400 species of plant life and 120 animal species-mostly wonderful singing birds. Nine AM the next morning we arrived at the end of the line, in Adelaide, for the Great Southern Railway. The sleeping compartment was numbered five & six for our berth numbers and had a beautiful gold paneled door. The upper and lower beds were wide and laid out like VIA Rail of Canada. The bathroom/shower was the largest we’ve experienced in a train room. We enjoyed music from a clear sound system and there was plenty of light to read at night – both of which are missing from Amtrak’s double level sleeping cars. The rooms lock only from the inside. The crew worked as a team (often doing two jobs) with the beds being made during breakfast or dinner without having to ask. Your hospitality attendant, who also helps out in the restaurant besides making up the rooms, would bring coffee or tea to your room in the morning at a predetermined time as a wakeup call. A British Corporation provided the funding for this new trackage. The consist of the GHAN was: two NR locomotives made in Australia with 4,000 diesel/electric HP; three liters diesel fuel/Kilometer; 132 tons; 12,500 liters of diesel fuel; average speed of the entire 1,847 mile trip from Darwin to Adelaide is 53 MPH with the maximum of 71 MPH; four rotating engineers with a crew change in Alice Springs. One power van; one crew carriage; one luggage van; two coach carriages; Red Kangaroo lounge (no bar or enclosed smoking section); Red Kangaroo diner car; Red Kangaroo sleeper for 32 passengers; three sections of Gold Kangaroo sleeper carriages (nine double berths for 18 passengers and one room for the hospitality attendant) ; two sections of 18 single berth roomettes with larger rooms than Amtrak due to a serpentine hallway; Gold Kangaroo lounge; Gold Kangaroo “Restaurant” for 48 passengers each in two settings; two crew carriages; power van; four motor rail carriages ($700 to transport your car or $100 if you’re in Gold Kangaroo class which is $350 approx. premium over Red Kangaroo service); Total of 37 carriages, 380 passengers and a crew of 40. The carriages were built in Australia in 1969 and 1970’s under a license from Budd by Commonwealth Engineering Granville. The staff works five days on and one day off. The largest train was 52 cars with 510 people which was .7 of a mile long. The standard size of the train was reduced to 37 cars since the infrastructure at the tourist stops in Katherine and Alice Springs wasn’t able to accommodate anymore. There are also three deluxe suites for an additional $395/night – one double bed, a top bunk, small lounge, tv/video player and complimentary bar. While Julie & I enjoy our Amtrak and VIA Rail rides, the GHAN was the best train we’ve experienced: gourmet food and the highest level of service. The Australian trains lack dome cars, tables large enough for four people to play cards and safety straps for the upper berths. Arriving at the end of the line in Adelaide 80 minutes late in the land of sheep and rolling pasture land near the sea, the train platform wasn’t long enough to unload all carriages so the train was split in half. We disembarked 20 minutes after the first section. The Australia Southern Railway held their Indian Pacific and Overland trains for connecting passengers. We traveled from the warm rain forest near Darwin to the dry bush and rusty red flat lands of Alice Springs at the end of their “dry season” to the cool ocean breezes of Adelaide. 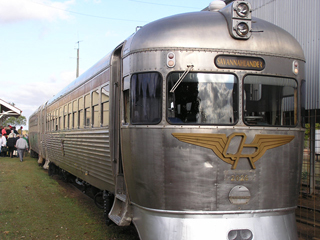 The Savannahlander was a unique two car rail motor train which made tourist stops along the way of its ten and a half hour trip from Mt. Surprise to Cairns. Per Rolland and Ted Creveling the cars were built in Australia in the early 1950’s for local transit and were like an old version of the BUDD cars (2/unit). They seated approx. 90 passengers with one seat right next to the engineer. The two engineers stopped for walks to see six foot high grass eating termite mounds; black orchids living high up in a tree; five emus; various wallabies; plains turkeys; the nest of the Bower Bird who had a collection of shiny glass to attract a mate and the very tall Barron Falls in spectacular Barron Gorge. The old narrow gauge line use to be used by the mines in the area over 100 years ago and sat idle until a New Zealander purchased it. Due to the lines age, Norma Dengler duped this narrow gauge the “shake, rattle and roll” train. Up over two mountain ranges, through 15 tunnels with lunch in a town of 26 people at the Almaden Hotel – it was a special experience. The Kuranda Steam Train runs over a short section of the same track from Cairns to Barron Gorge. Dinner trains: a ride and a good meal. We have ridden many of these and in our judgment the Napa Valley Wine train was the best for food, the Charlie Russell Chew Choo in Lewiston, Montana was the best for scenery (3 very tall trestles) and a realistic train robbery. 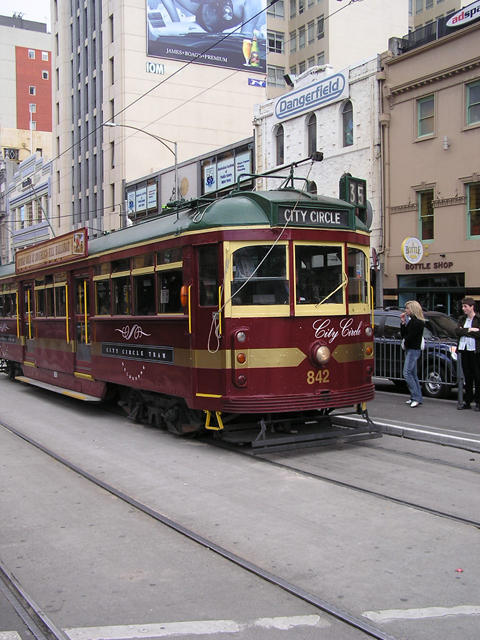 Overall though, our favorite is now the Colonial Tramcar in Melbourne, Victoria, Australia. The 1927 burgundy colored tramcar, one of three running for lunch seated 48 in two sections with the compact kitchen in the middle. The car was elegantly appointed for the 1920’s period. 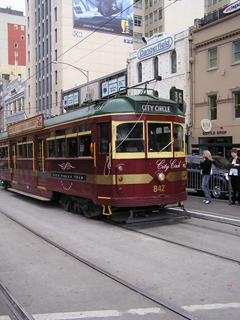 Our two hours took us all over town on electrified rails via trolley wire. The four course gourmet meal started with chicken liver cream & cognac pate, which surprisingly we enjoyed, champagne, shellfish bisque or kangaroo loin salad, prime rib fillet, red or white wine, various cheeses with crackers & fruit and after lunch liqueurs as well as presenting the ladies with red or white carnations. The alcohol was unlimited and cost was approx. $63US which is less than we usually pay. Both rides were very memorable!